While most Bug Out Bags, Get Home Bags, and 72-hour kits that you read about focus on long-term survival, there’s one area that’s often overlooked. What happens during those times when you can’t carry a bug out bag? Let’s face it; having a 30-pound bag of gear at your side at all time is pretty impractical. Yes, you can have multiple bags stashed at your home, office and even in your vehicle, but no matter how much you prepare there are going to be times when you become separated from your main stash of gear. That’s why I suggest always having an EDC Kit. EDC stands for Every Day Carry. Every Day Carry (EDC) is an extremely important part of your preparedness plan and is something you should put some serious thought into. What goes into your EDC will depend on your unique survival needs, but in general, it should contain basic supplies that will hold you over and provide protection until you can safely make your way back to your main stockpile of survival goods. The gear you choose to carry as part of your EDC is something that you should have on your person at all times, so it needs to be small, lightweight and easy to carry. While many of us who are prepared have our important gear close at hand, stored in some sort of bug out or get home bag, there are going to be times when you may be separated from your main source of supplies. That’s when having an EDC become so vitally important to your survival. In most cases, your EDC should be small enough to fit in a pocket, and should only include gear that is absolutely necessary to sustain you until you can reach your primary source of supplies. If you work in an office, and regularly carry something like a briefcase, then you may be able to get away with carrying a slightly larger EDC. But in most cases, they are small, and can usually be comfortably slipped into a pocket without attracting attention. 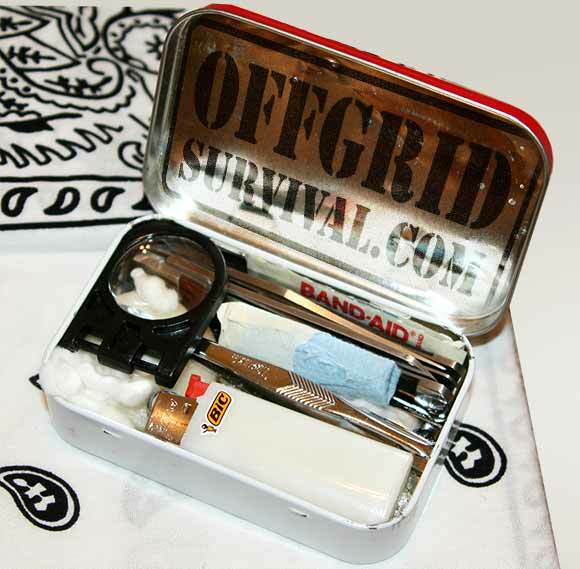 These little Altoid Tin kits have become extremely popular and are a great way to pack a bunch of essential gear into an easy to carry discreet case. To give you an example of what you can fit in one of these small tins, I have included a kit that I often take with me when I’m going out into the wilderness to hunt or fish. Your kit should be tailored to fit your unique needs and environment, so if you live in an urban setting many of these items will probably be useless to you. But I’m going to show you what I carry in this situation to give you some general ideas and show you how many items you can comfortably carry in this type of EDC. Bic lighter & a couple of half matchsticks with a striker in plastic wrap. Bandana wrapped around the case. When in an urban setting, I usually always carry something like the kit in this picture. This kit allows me to carry a decent size knife while being able to add a number of items right to the front pocket of the Sheath. 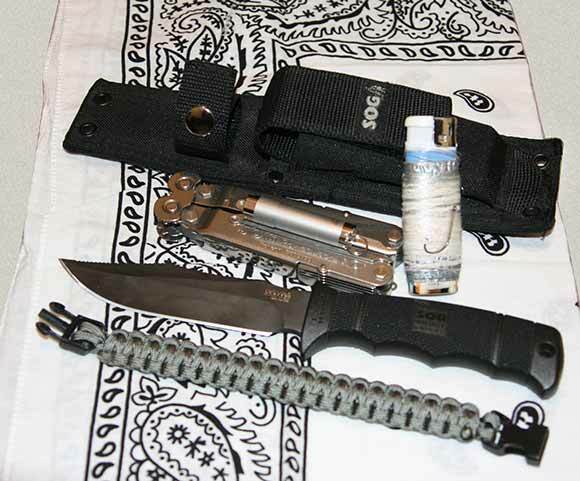 In this case, I am showing the SOG Seal PUP Elite with Nylon Sheath. It’s something that I carry almost everywhere I go, whether it be in an urban or wilderness setting. Carry an EDC Kit? What Items do you include? My preference is to NOT carry essential items in kit form, but rather carry them distributed among pockets and belt. Any kit that can contain enough items to be useful is going to be uncomfortable to carry at all times if you’re wearing the type of clothing normally worn down here in The South – even a small Altoids kit. 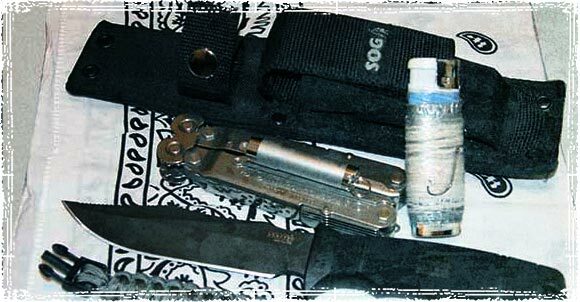 A good pocket knife, handkerchief, and Speed-Strip of spare ammo fit in one pocket; LED flashlight and cell phone are in pouches on the belt, while a revolver is inside the belt and under the shirt; “Peanut” lighter and whistle and tweezers are on the key ring in the other pocket. Distributed this way just works well for me. I agree with this minimalist approach and posted my own comments below. I don’t live in the south, however, but in the Pacific northwest. Among the survival supplies, small med kit & my trusty glock, I carry other supplies essential to my job. I carry my laptop & charger, a thumb drive, extra pens & receipt books, & my nalgene water bottle. Also, some paracord, gloves, flashlight, & a bandana. People often go overboard on their EDC bag, forgetting it’s an Every Day Carry, they turn it into a BOB bag by overloading with survival supplies. Carry the things you use EVERY DAY. Your BOB is for everything else. Beat me to it, well said! I do wish I could get away with wearing a belt knife and sheath mounted kit every day, but working in an office, my EDC kit is relegated to my pockets. If necessary, it then could be supplemented by my truck bag which is in my vehicle, but not as accessible. All you need is a good knife. The rest are luxuries. Good point. Well maybe a bit more but a good knife and a small flashlight are great. Fishing stuff???? Seems like a waste to me. I want to get to my vehicle and/or home to the BOB ASAP. Stopping to fish is the last thing I am going to do. But if it makes you feel better…..
A good knife and small, higher lumen flashlight. I like to carry 3; a small multitool(Gerber Bear Grylls), a good sharp knife, and a strong small flashlight(84 lumens), that uses AAA batteries ’cause its light and you can easily find a replacement. I agree that fishing supplies should be in a BOB. Personally, I think most fish will end up contaminated along with the water. But if you must fish, try something that a lot of us countryboys use, a trot line. Set it and leave it while you hunt squirels and rabbits. Sitting around waiting for one fish to bite one line is very unproductive when it comes to survival. I tried to teach myself to fish naturally and it works so easy. I always dug up worms on the site 20 feet away. Bamboo, hooks, swivels, line… I caught nice sized catfish and blue gills. 2-3 in two hours every time I went on these natural fishing endeavors. Fish in lakes not rivers and in the VERY early morning. I like this EDC kit, especially for a woman. It’s not so easy for us with the clothing we normally wear. This allows me to have everything neatly placed in one quick to reach location…my purse. I have an altoid fishing kit in my BOB but this is a great idea. Thanks…from the ladies! I also keep the small kit in my purse, but have another in the diaper bag…I usually end up forgetting one or the the other in a rush to get out the door, so this way I am covered either way! It’s so great to see women getting into prepping! I want to recommend having a flint striker, lighters and matches run out. It’s also wise to have an emergency blanket. I strongly agree with the flint and steel, actually quartz works very also. For the striker I took an old file and ground the edges smooth, then put it in a vise and snapped off about a 4″ section, works great. My first fire took a while but my third one was blazing in under five minutes. Check out you tube for flint and steel. I think everyone should be able to build a fire this way. I know I felt good being able to do it in the most ancient fashion. For my money, I liked using the Lexan N-case series for waterproof EDC carry. Good article. I don’t carry any of those things yet, except a knife, a good one, and and my essential meds in a small container. You make a good point. If your not carrying your medication your missing out on something that can take you out of the fight before it even begins. I like the Leatherman Wave in the nylon case, it has the Wave, a sleeve behind the tool for a few band aids and a pack of Neosporin to-go (I am sure some other items could be placed there too); the elastic sides are loops that have a small fisher pen and a small firesteel on either side, and the Velcro closure has a small pocket for a folded up $20 bill. Then on my key ring I have a Freedom Micro light and a small stainless pill fob for a vial of nitro-glycerin. A bandana is always in a pocket as is a tube of Vaseline lipbalm. This will get me to my vehicle where my GHB resides. For my EDC I carry a bic lighter, a Victorinox Farmer Silver Alox pocket knife, a Fenix E11 LED Flashlight, a small ferro rod, a donut of about 15 feet of 115 lbs bank line on a carabiner with my keys, cell phone, wallet, and a small Gerber folder. I carry my phone, wallet(with credit card multitool), 2 folding knifes, 2 550 bracelet, blue line flashlight, belt, and s&w tactical pen. Just added the leatherman style cs. The belt loop of the pouch is velcro-secured, so can be looped through the belt loops on jeans etc even if no belt is worn. In addition, I also wear a paracord bracelet (made myself, so replaceable if need be) and if the need arose, could trade my Submariner watch for something. I also carry my BOB any time I leave the house. Great article, clear and concise. I prefer minimal EDC and dispersing the items on my body. Around my neck I have a paracord necklace that has a small whistle, red LED mini-lite, and a button compass tied on. On my wrists I have a watch on one and a paracord bracelet on the other (about 7 feet). In my pockets I have a Bic lighter, a small folding knife, and on a key-chain a mini-flashlight. In my wallet I have some bandages, a pre-threaded needle, and 4 safety pins. My clothing I consider to be my first level of shelter. I frequently carry a small backpack that has more items, but sometimes I don’t have it. I guess it’s more of a GHB than EDC. You see first of all .. A EDC is deferent than a Bug out … EDC servers best those work in the field .. Bug out is for more civilians who under the worst case scenarios still have few moments to grab thier Bug Out bag .. I don’t think everyday carry, or EDC, is or necessarily should be associated with survival gear or bug out paraphernalia. My personal vehicle is equipped with both wilderness and urban survival items, yet I don’t carry any of those types of items on my person. I have a backpack with some items in it, but I don’t carry the backpack, which is a North Face, on me. Rather, it’s more of a portable container. It’s not even close to what you’d call “full.” The built in storage compartments in my four door pickup have more of those sorts of items including spare ammunition since I’m a “hobby shooter,” but my EDC includes my wallet, vehicle remote and three keys, Droid, Streamlight Micro, Glock 23 in an IWB, Kershaw Leek and depending on what I’m doing a Wenger SAK I’ve had for nearly 20 years or Leatherman Juice S2. Easy and sufficient. I’d agree, there has to be a balance. I tend to carry first aid items (since our med kit is always poorly stocked), tools (since we have almost nothing when we need it), I wear a cap-light (the ones with built in LED’s) if the lights go out, and my phone with a charger that is permanently left at work. There is no need to drag a ton of stuff with me.. why draw attention to yourself? Where I work, extra stuffed pockets raise suspicion of theft, so less is better. Again, I can get away with a lot being the “on call” first responder, and carrying a large medic bag with me. Honestly, if something bad enough happens, that I can’t make the 30 second dash to my truck for needed gear (other than the first aid), its a bigger problem than I could possibly prepare for. I wish I could get comfortable with the man bag/ man purse concept. The good sense of EDC items along with other necessary items that men carry these days, well, a man bag is very practical. But as much as I want to believe I don’t care what people think, I still believe it looks feminine. You might want to check out something called the North south shoulder bag by Derek Alexander. Reminds me of Indiana Jones size bag, but has multiple amazing pocket for organizing. Comes in black and OD green, so pretty inconspicuous. My hubby loves his now that he’s used to it. I have one too and can put more in it than larger bags I own. They have a website so you can take a look. This site is outstanding. I’ve read some really interesting and thought provoking ideas. Keep up the great work and stay motivated!